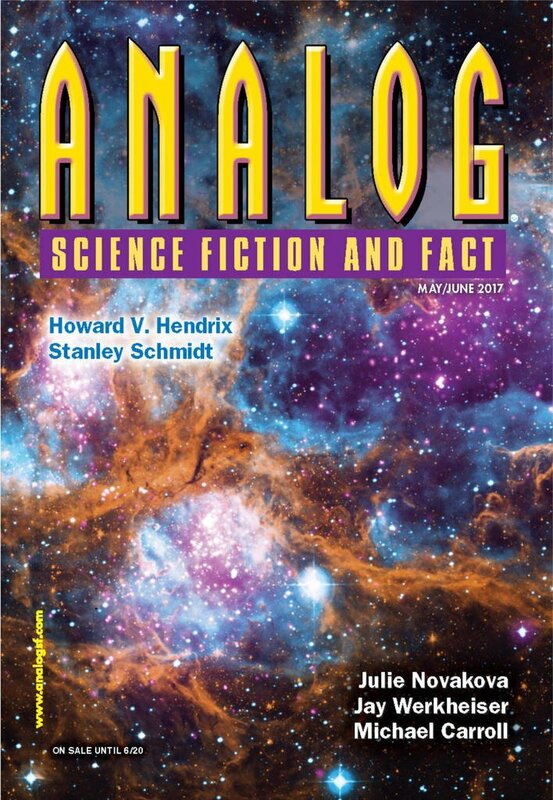 "The Speed of Faith in Vacuum," by Igor Teper [bio] (edited by Trevor Quachri), appeared in Analog Science Fiction and Fact issue 05-06|17, published on April 20, 2017 by Penny Publications. Pro: The colony struggling to hold on is very realistic, and the fact the starship is in the same state makes perfect sense when we learn that Earth has dropped out of the picture. Grigoriy is very talented, so it’s no surprise the starship wants him. The ending is sensible and complete. Con: The story never made me believe that fooling people was really a good thing for the colonies. I’m also surprised the colonies didn’t communicate with each other. And it seems odd that they’ve got interstellar travel and yet still depend on crops for food.